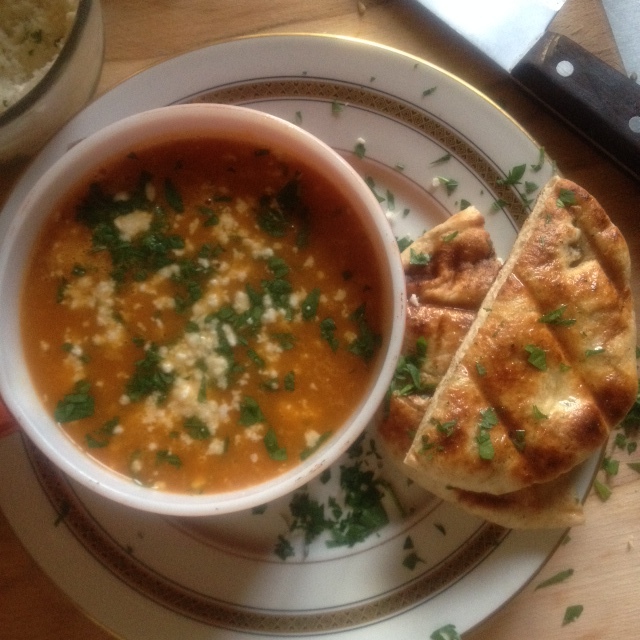 Heirloom tomato soup with Grilled Herb Flat Bread. August and September are some of the most rewarding months of the year for a farmer. You are literally reaping all that you have sown. Late spring and early autumn have always been the busiest times of year for me. Not only am I spending many hours harvesting but also preparing ground and new seedlings for fall planting. And the fun doesn’t stop there because when I go home at night there are boxes of tomatoes just waiting to be turned into salsa or sauce. The tomato soup dinner that occurred recently was purely the result of trying to find a way to make dinner and tomato sauce at the same time. I am a big fan of multitasking (coffee and breakfast in the bathtub, don’t knock it til you try it).